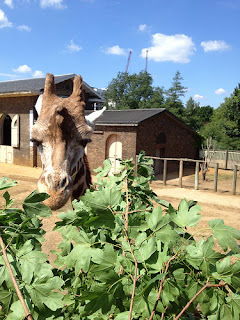 No, this is not about pests, rather horticulture at London Zoo. Had you ever thought of zoos as places for horticulture? I hadn't. That is, until a month or so ago I heard Kevin Frediani, Curator of Plants and Gardens at Paignton Zoo, talk at a conference. He mentioned that while ecosystems are made up of both plant and animals, too often our research, conservation and education institutions don't connect the two together in their living collections and exhibits. Then he went on to talk about the high density vertical growing fish-based hydroponic system they use at the zoo to grow some of the fodder for the animals. Pretty exciting stuff, really, so, when the Arboretum manager announced the opportunity to go on a visit to ZSL London Zoo, he got my attention straight away. Today was the day, and I must say I was not disappointed. Plenty of exciting stuff is going on in London too, and with a focus on being environmentally friendly (they are in fact certified to ISO 14001 standards): for example they no longer buy mineral oils, minimise pesticide use and compost their green waste in an arrangement with Royal Parks. They are also looking into interesting practices, such as beaver coppicing (did you know beavers coppice regularly every 7 years or so?!?) or scything as a meadow management technique. 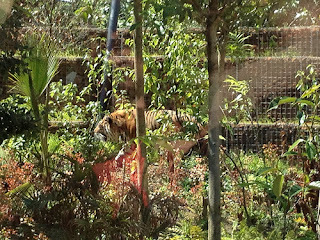 There are different aspects of the zoo that the horticulture department takes care of. One is of course bedding displays, as the zoo is a tourist attraction and has to be a pleasant place to walk around. In the greenhouse, we saw some of that bedding. But then there is the more exciting horticultural stuff. For example, new exhibits, where plants complement the presence of animals and help create a comfortable place for them to live in. For the tigers' project, the keeper went to Sumatra to study their native environment, and got photographic evidence so that a suitably complex environment could be recreated, to keep the animals interested and provide them with privacy from each other (in nature male and female only get together for mating) and the tourists. 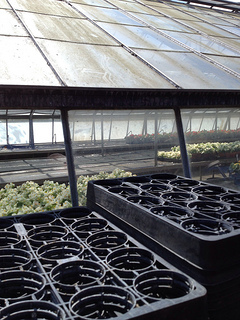 Last but not least - actually last and most interesting - the horticulture department does feedstuff research. Apparently, so many animals in zoos are overweight and diabetic because they are fed an unsuitable diet, rich in fruit and grass (i.e. bamboo, suitable for grazers) but many animals are browsers instead, so their diet should consist in leaf matter! On the back of that consideration, the zoo first launched a wiki for the zoological community to share their knowledge on which plants to feed which animals... Then they started a programme of nutrient testing on a set of plants on site: they are analyzed three times a year to understand how the nutrient balance changes and might affect the animals' diets... and they've also got a leaf silage initiative - time intensive but successful thanks to the help of volunteers - for winter feed (with excellent results, nutrient-wise). We had the privilege to experience what that more true-to-life feeding of animals means: a couple of small Acer campestre were felled in the woodland area and fed to the giraffes. In the picture, one of them tucking in into the branch I was offering her - It's fascinating, but note: they do pull hard! A very enjoyable visit and food for thought... I will certainly consider applying to horticultural jobs in zoos.